The Last Crusaders is a fantastic RPG developed by Shanghai Islands of Adventure Infotech. You will play as the mastermind of your army. You assign priorities, tell your allies when to use their ultimate abilities, etc. A good strategy is the key to success on the battlefield. If a battle looks hard, try a different approach. Every hero you can summon in the game has a unique trait. So even if two heroes are within the same class, they may play vastly different. 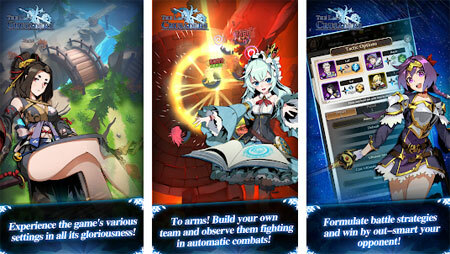 Try new combinations of skills, gears and strategies, and you may find a new role for your favorite hero. All the strategies and team management are planned out pre-battle, no further control is needed during a fight. Take on teams carefully put together by others with your own, exploit their weaknesses, and rise through the ranks in the Arena. If you get stuck in the game, check out the video walkthrough and gameplay for the game. This entry was posted in Android Games, Mobile Games, Walkthrough and tagged The Last Crusaders Cheats, The Last Crusaders Gameplay, The Last Crusaders Guide, The Last Crusaders Strategy, The Last Crusaders Walkthrough by Marvin. Bookmark the permalink.